September 1970 was the start of the Jordanian Civil War, which fomented a major U.S. military presence in the Middle East. Dave was serving in the Air Force at the time and was sent to Turkey in preparation for a major conflict in Jordan. The ensuing crisis earned the name Black September. It was triggered by the Palestine Liberation Organization (PLO) fighting King Hussein of Jordan in a battle over who would rule the PLO. That month saw multiple failed assassination attempts on the king, several hijackings of passenger planes — which were detonated in front of television cameras after the hostages were taken off — and the threat of a much larger-scale conflict. The United States sent a significant naval fleet to the region, while Syria waged an unsuccessful bid to intervene on the PLO’s behalf and the Soviet Union kept a wary eye on the situation. For Dave, sent to Turkey on September 9, it was a time fraught with uncertainty and risk. He worked day and night assembling missiles that might have to be used with U.S. involvement. The conflict would ultimately end without the United States or the Soviet Union getting directly involved on the battlefield, though it left thousands dead and resulted in the expulsion of the PLO to Lebanon. But as I learned during a dinner with Dave in late January, the events of that September remain vivid for him — yet he’s amazed how few people know about it. He’s only seen a handful of articles written on the topic, so wants to use his personal experience to write a book about it. 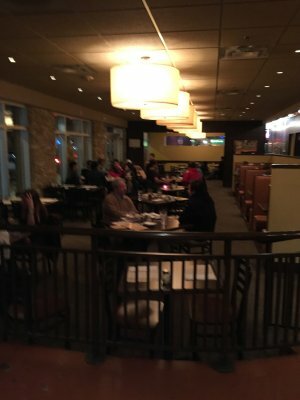 Over a meal of Italian food at what’s known as the Original Ledo Restaurant in College Park, Maryland, Dave said he’s still figuring out how best to the approach the project. But as a former military man, he thinks he has the right insight to share details of the U.S. presence during that time, which was top secret until released through President Nixon’s papers in 2007. Black September is one of many topics Dave and I covered during our meal, which also touched on his time at the University of Maryland (UMD), his early days in the air force, and his current work writing environmental permits for paint spraying booths across the country. He’s got anecdotes for all of his various careers, but as he told me during our meal, his current focus is on being a writer and pulling together all of his thoughts on September 1970. He said the book will be the perfect mix of his military expertise (he started in the Air Force working on missiles) with his first-hand personal reflection on being in the Middle East during the crisis. Throughout our meal at the Original Ledo Restaurant — the first of what’s now a chain in the area — Dave showed me military photos and articles to highlight what he said is the gap in coverage of Black September. He’s currently planning how to lay out the book before starting writing. 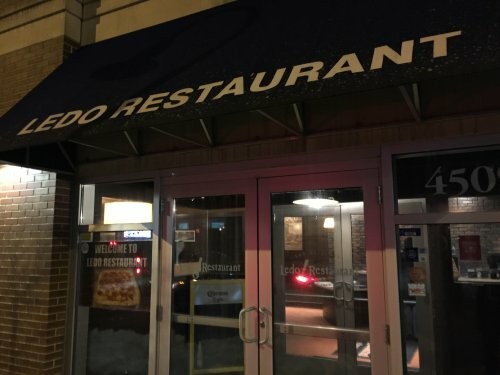 Ledo’s is a fond destination for Dave given that it’s located so close to his alma mater. Indeed, the place has the look of a college bar and restaurant. Big television screens allow for watching whatever sports games are happening, and huge tables, a welcoming atmosphere, and cheap prices likely win over students. There was a game on TV when Dave and I met so the place was busy, but we found a quiet booth where he could tell me about his planned book. Sidetracking from his life story, Dave told me about Ledo’s unusual approach to pizza that’s served in a rectangle on a cafeteria tray. This sounded odd enough that I had to try it, but neither of us were in the mood for a full-size tray of pizza that night. 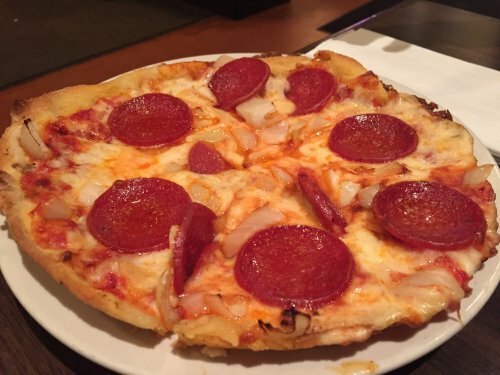 So we started by snacking on one of Ledo’s small circular pizzas, topped with pepperoni and onions. The crust was different to many pizzas I’ve had — it wasn’t quite chewy, and it wasn’t quite crispy. Unfortunately it tasted dry and too salty. And the dish could have used some more careful preparation, because the toppings easily slid off into a mushy, rather bland mess on the tray. 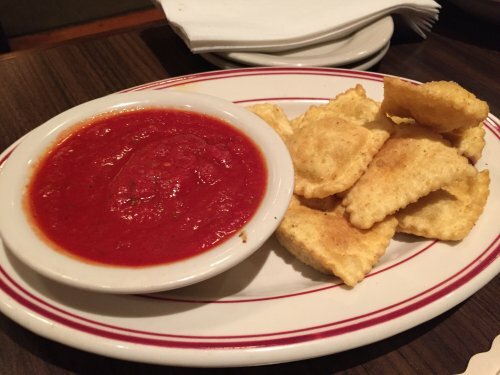 I was however won over by our other starter of toasted ravioli served with marinara sauce. These crunchy pasta bits were stuffed with tender meat, and the sauce was a hearty, tangy dip. I felt a little guilty because they were so moreish I guzzled most of them before Dave could have a few. But Dave had tried the ravioli before, and has known about the restaurant for years. 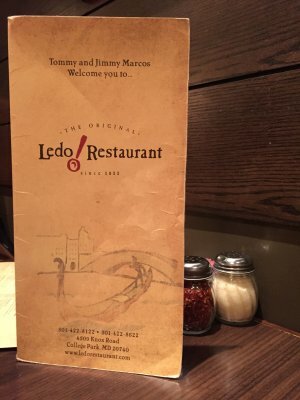 He associates Ledo’s with his college years, and generally said he remembers places mostly based on experiences with food, like the diners he found while traveling for his current permitting work, or the first time he tried calamari in Spain. 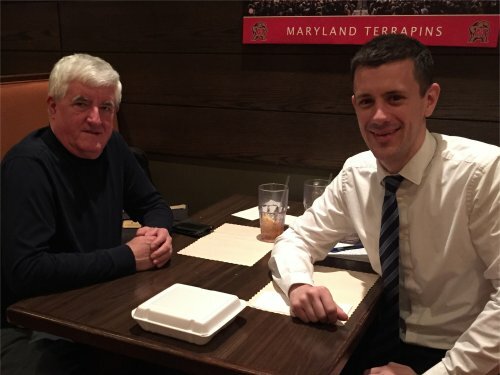 Dave grew up in Maryland, going to high school near UMD and then attending the university to study electrical engineering, starting in September 1965. This was during the Vietnam War, and Dave saw many of his friends drafted and sent to a country from which they’d never return. Wrestling with his own future, Dave eventually decided to sign up with the Air Force in September 1967. The military recruiters said his electrical engineering background meant he’d probably be a good fit to work on missile guidance and control, finishing his education at school in Denver — much better than being dispatched to Vietnam. Students were allowed to list places they’d like to be stationed after completing school, and Dave listed Germany, Holland and a novelty pick of Las Vegas. As fate would have it, he got the Vegas position and was sent to a missile testing base in Nevada. Building and loading missiles was a precarious job. Dave showed me photos of people carrying the missiles by hand, yet if they dropped the wrong part, the device could go off. One of Dave’s jobs was to review the missile testing firing reports. He noticed that the missiles weren’t hitting anything but couldn’t figure out the reason why. So one day he went down to the testing area — where missiles were fired into the Nevada desert — and discovered that the testers were putting the missiles inside the firing device the wrong way round. This meant that missiles designed to be “lofted” (fired into the air, then the guidance system kicks in) were being used as “dive” missiles that are meant to be fired from a height, and vice versa. “One of the guy’s faces went white when I told him,” Dave said, as he laughed and shook his head. Another time, he had to deal with missiles that were being aimed at disposed trucks but not hitting their targets. He went out at night to the test field, which was illuminated with light bulbs powered by a generator. Dave noticed that the heat-seeking missiles tended to drift left, in the direction of the generator. So he moved the generator behind one of the trucks. The testers fired the missiles. Right on target, it tore the truck apart. The heat from the generator had been distracting the missiles, something that was so simplistic that it still amuses Dave to this day. After some time in Vegas, Dave was transferred to the Air Force’s base in Bitburg, Germany, where he was trained in “smart” weapons. It was during his time in Germany that Black September happened. His first inkling that something was up was when he got a memo on September 5 that year telling him to get to the barracks, get his bags, and get ready to go to Turkey. “The base in Turkey was used for spy planes, so I knew there was something wrong,” he said. “We worked all hours putting missiles together,” Dave said. “Then it was back to work the next day doing the same thing.” Tensions increased when the PLO started exploding the captured airplanes. “That’s when everyone got real serious, and the U.S. called for backup,” he added. He drew parallels between the Middle Eastern conflicts back then to the battles that are happening nowadays in the region, as well as the wars following 9/11, and said in a serious tone that it’s important people be aware of Black September so they can place the current battles in context. Yet despite the serious topic, Dave is not a humorless man, and he was quick to smile and laugh when recounting some of the more offbeat stories from his past, like the misguided misses at the testing range. 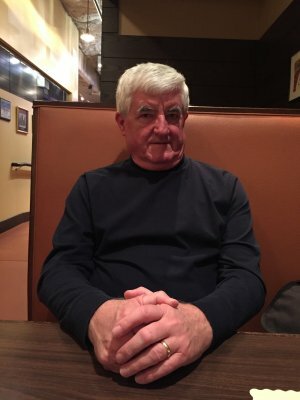 His time with the military ended with his discharge in December of 1970, after which he went to work at a Volkswagen garage in College Park — the same neighborhood we were in for our meal at Ledo’s. Our waitress had returned, so Dave paused his story for a moment. 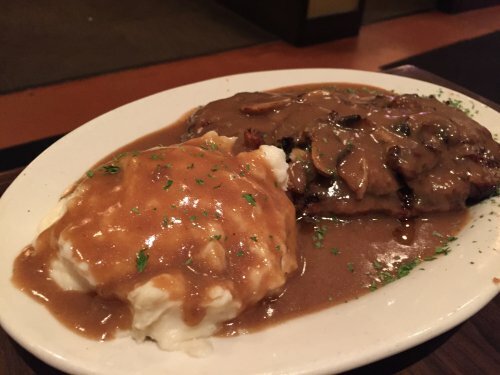 He’d opted for the chop house streak of charbroiled ground beef served with sauteed mushrooms, gravy and mashed potatoes. It looked hearty, though I didn’t try any. 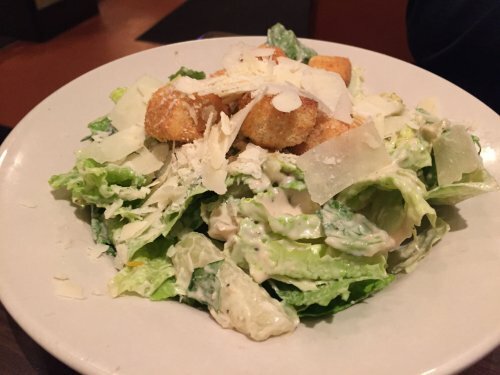 Dave also chose a Ceasar salad as a side for his main course. 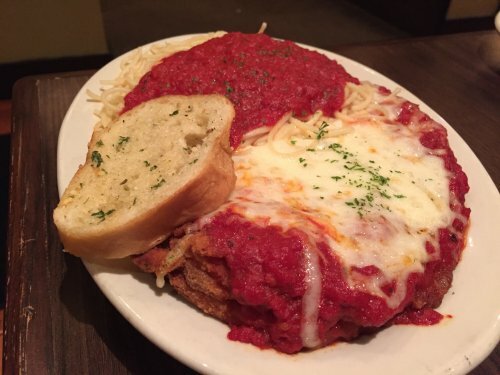 I went for the chicken parmigiana, topped with melted provolone cheese and served with spaghetti and the same tangy marinara sauce as the toasted ravioli. The spaghetti was perfectly cooked, and I was already a fan of the sauce that it came with, so I thought the dish was off to a good start. Then I cut into the chicken. Or tried to. The batter and the meat were so overcooked that it was like trying to slice into rubber. And the excess cooking meant the meat — which took up more than half the place — had no flavor, so I had to drown it in the sauce. 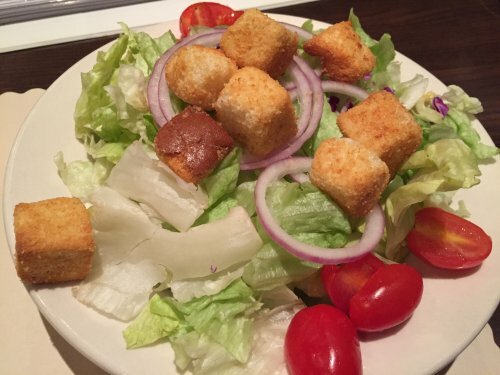 Thankfully I still had some of the ravioli left, so I picked at that and a house salad of lettuce, tomatoes, croutons, and onions while we continued the interview. Dave said that after the Air Force, he tried his hand at various jobs over the following years, including some work as a technician at UMD’s physics laboratory. He also taught some classes on car repair, which is where he met his future wife Susan. Eventually — after stints running a gas station and selling engine testers to auto repair shops — Dave went into business selling paint spray booth equipment to the vehicle collision repair industry. After developing significant experience in the field, he had become very familiar with the highly technical and complicated permits for the booths, which many people in the industry didn’t understand. “Susan said, ‘Why don’t you do the permits for all these guys you’re selling to?’” said Dave. Since 1989, that’s what he’s been doing, operating his own environmental consulting firm with major clients over the years include the Federal Bureau of Investigations, the Drug Enforcement Administration, the Secret Service, and hundreds of auto body shops and car dealers. His business is all through word of mouth. The permits are so complicated that there is no-one else out there who understands them as well, Dave said, which is how he maintains a steady list of clients. Being self-employed means his days are often unpredictable, but he said he likes not knowing where he’s going to be or what he’s going to be working on from day to day. The flexibility of being his own boss will probably also be a huge benefit as he gets ready to add “history writer” as yet another title on his ever-expanding resume.